In technical terms, anxiety is apprehension over an upcoming event. We anticipate the future with sometimes scary predictions that don’t necessarily have any basis in truth. In everyday life, anxiety’s physical and emotional symptoms can mean an increased heart rate, poor concentration at work and school, and sleeping problems. Focus on meaningful activities. When you’re feeling anxious, it’s also helpful to focus your attention on a meaningful, goal-directed activity. Try asking yourself what you’d be doing if you weren’t anxious. If you were going to see a movie, still go. If you were going to do the laundry, still do it. The worst thing you can do when anxious is to passively sit around obsessing about how you feel. Doing what needs to get done teaches you key lessons: getting out of your head feels better; you’re able to live your life even though you’re anxious; and you’ll get things done. So the bottom line is, get busy with the business of life. Don’t sit around focusing on being anxious – nothing good will come of that. Take a deep breath. Deep diaphragmatic breathing is a powerful anxiety-reducing technique because it activates the body’s relaxation response. It helps the body go from the fight-or-flight response of the sympathetic nervous system to the relaxed response of the parasympathetic nervous system. Try slowly inhaling to a count of 4, filling your belly first and then your chest, gently holding your breath to a count of 4, and slowly exhaling to a count of 4 and repeat several times. Accept that you’re anxious. Remember that anxiety is just a feeling, like any other feeling. By reminding yourself that anxiety is simply an emotional reaction, you can start to accept it. Acceptance is critical because trying to wrangle or eliminate anxiety often worsens it. It just perpetuates the idea that your anxiety is intolerable, he said. But accepting your anxiety doesn’t mean liking it or resigning yourself to a miserable existence. The bottom line is that the feeling of anxiety is less than ideal, but it is not intolerable. Question your thoughts. When people are anxious, their brains start coming up with all sorts of outlandish ideas, many of which are highly unrealistic and unlikely to occur. And these thoughts only heighten an individual’s already anxious state. Use a calming visualization. Practice the following meditation regularly, which will make it easier to access when you’re anxious in the moment. Picture yourself on a river bank or outside in a favorite park, field or beach. Watch leaves pass by on the river or clouds pass by in the sky. Assign [your] emotions, thoughts [and] sensations to the clouds and leaves, and just watch them float by. Focus on right now. When people are anxious, they are usually obsessing about something that might occur in the future. Instead, pause, breathe and pay attention to what’s happening right now, he said. Even if something serious is happening, focusing on the present moment will improve your ability to manage the situation. Here are some simple steps you can take to strengthen your memory every day. Take breaks. There’s a way to never cram again and still remember what you learned. Researchers have determined that people who break their study time into chunks actually learn better than those who study for hours at a time. “Spacing out your learning and allowing time for forgetting to occur in between study sessions can promote your ability to remember information and promote your ability to learn concepts,” says researcher Haley Vlach, PhD, assistant professor of educational psychology at the University of Wisconsin, Madison. Write by hand. Foregoing the keyboard for pen and paper may actually be better for the brain, according to a study in the Journal of Cognitive Neuroscience. People are better at remembering the orientation of a new character if they write the characters by hand rather than type them on a computer keyboard, the study found. And research in children has shown that writing with pen and paper activates more regions of the brain than simply tapping a keyboard. Play a computer game. Don’t write off computer keyboards entirely. In one study, adolescent girls who regularly played the computer game Tetris had changes in parts of the brain involved in critical thinking, reasoning, language, and processing, among others. The game requires players to manipulate shapes as they fall so as to create an ordered row of tiles. And while Tetris may be 25 years old, it’s still available on all types of gadgets, including the iPhone and iPod Touch. And anagrams themselves–forming new words with the letters of an existing word–are good for stimulating the brain. You can find ways to tease your brain at GamesForYourBrain.com. Meditate mindfully. Emerging evidence shows that people who routinely meditate can produce physical changes in the brain. This increases not only attentiveness but also self-awareness and empathy. Bonus: It costs nothing and can be done anywhere, at any time. Read out loud. Reading a book or the newspaper out loud stimulates different parts of the brain than reading silently to yourself. This article was originally written by Amanda Gardner of Health Magazine. We shared this with you for its helpful tips on improving our memory and keeping the brain active and healthy. We know we would be better off if we slept for eight hours every night. And did yoga five days a week. And ate kale and ran marathons and kept a gratitude journal and shopped at the farmer's market and learned to play the viola. But we all don't. Every one of these things would require a huge lifestyle shift. Well, maybe not kale, but the point is that committing to too much change at one time is a recipe for failure. Get enough sleep. Yes. Sleep deprivation ruins health, diminishes competence and leaves us feeling unhappy. Commit to getting your full seven to nine hours every other night. While consistency is ideal, many of the worst effects of inadequate sleep are associated with compounding deprivation over the course of several nights. If you absolutely have to work late Monday, don't do it again Tuesday. If you find yourself out until bar time on Friday, lay low Saturday. Unplug and recharge. The pros of unplugging sound great, but we use our smart phones for everything. Not to mention the fact that we can no longer focus, navigate or remember anything without the aid of an electronic device. Baby steps. Even if you can't bear to unplug during the day, don't keep your phone in arm's reach while you sleep. Having a smart phone on the nightstand is associated with poorer sleep and insomnia. If you use your phone as an alarm clock put it across the room from your bed. This has the added bonus of forcing you to get out of bed when it goes off. Find time to pursue your hobbies. “Flow” is a term psychologists use to describe a state of invigorated concentration experienced while pursuing an enjoyable activity. Playing an instrument is a classic example, but for the utterly talentless among us there are some more attainable alternatives. While "drinking" or “napping” may not count as a flow activity, thought-provoking discussions where you lose track of time certainly do. Even if these conversations take place in bars. While channel surfing is mentally discombobulating, various kinds of media consumption (some movies, most video games) can produce a sense of flow, provided the content is sufficiently stimulating. It may not be easy to quit, but science tells us that multitasking is not all it's cracked up to be. Staying focused and concentrating on one task at a time is worth a shot and we may end up getting more done (and feeling a whole lot calmer) in the long run. While most of us are susceptible to multitasking, research suggests that people who have a harder time blocking out distractions and focusing on a single task are more likely to be multitaskers. Those of us who do multitask often overestimate just how successful we are at doing so, to boot. But there's hope for us yet. Once you're willing to accept that multitasking isn't doing us any favors, follow these tips for focusing on one thing at a time -- without sacrificing productivity. Put down the phone (gently!). Block out distractions while you work, hang out with friends or play the guitar by turning off the phone, TV and anything else that draws you away from what you're actually doing. Get into a routine. This can be helpful if you spend a good chunk of your day on the computer or working from home. Instead of diving in to tasks willy-nilly,set up a schedule that tells you what to work on and when (and be sure to incorporate some breaks into the day). That way, you'll know what to expect from yourself each time you sit down to work (and you'll be less tempted to goof off online or tinker with household repairs). Set goals. Know what you're going to do before you start doing it. If you have no clear path, distractions can come easily. Before starting a new task, take a few minutes to plan out the steps you'll need to complete and in what order -- that way, you'll be less able to wander. An important step of goal setting? A quality to-do list. Eat a good breakfast. Turns out taking a second to chow down on a healthy breakfast can help boost concentration and focus. Bonus points if that mealincludes some protein. Meditate. 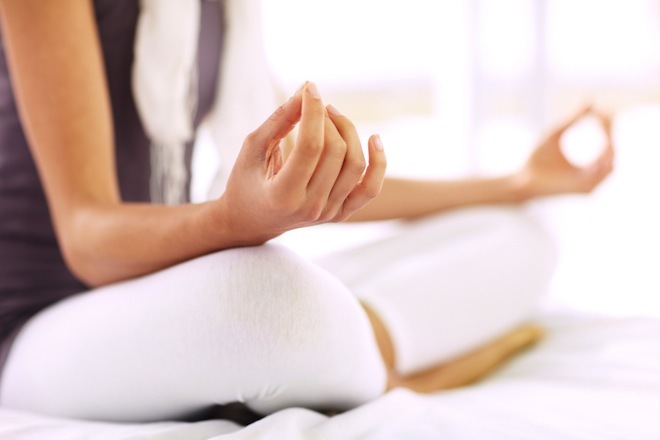 Studies suggest that regular meditation can boost brain function and is associated with better focus and attention. It can also help reduce stress when a massive to-do list is looming. Listen well. We're not being the most productive when we're half listening to someone while checking our phone, Facebook and LinkedIn all at once (also, it's just plain rude). To be a better listener (and get the info you need the first time),face the speaker and look him/her right in the eye and stay present with the conversation. Who cares if you have 12 unread emails; this person deserves your attention. Cut out clutter. To help avoid distractions, stay organized. Find a place for everything on your desk and keep your paperwork in order so you're not wasting time searching through piles of files (say that five times fast). This goes for your desktop too: Keep files organized and close extra browser windows and taps so you can work with a clean screen. For an extra boost, apply some Feng Shui principles to your workspace. Give yourself a break. Catch yourself staring at your computer? Literally, just staring at it? Probably time for a break. Studies show taking brief breaks during a task can improve focus. So take a walk around the block, get up and do some jumping jacks or take five minutes to face the wall and breathe deeply. It's good for you, and it's good for your productivity -- win-win! Stress is different things to different people. It’s also different things at different times to the same person. In other words, stress is very individual, and whether something becomes a stressor to you depends on a variety of variables and with so many sources of stress, it is difficult to find time to relax and disengage. This is why stress is one of the biggest health problems facing people today. Chronic stress increases the risk of developing health problems including obesity, diabetes, heart disease, cancer, and a weakened immune system. Chronic stress also affects a person’s mental health. When someone is under chronic stress, it begins to negatively affect his or her physical and mental health. The body’s stress response was not made to be continuously engaged. Many people encounter stress from multiple sources, including work; money, health, and relationship worries; and media overload. Breathe. Perform diaphragmatic or “deep breathing” exercises. One way is to lie face down on the floor and begin breathing deeply and slowly, with your hands resting under your face. Do this for five minutes. Meditate. Use visualization or guided imagery to help you learn to be one with your thoughts. Sit quietly with your eyes closed, imagining the sights, sounds and smells of your favorite place, such as a beach or mountain retreat.Set aside a time every day to work on relaxation. Get a hobby. Exercise regularly, take up yoga or make time for music, art or other hobbies that help relax and distract you. Talk to your family and friends. See if they can help. Research has shown that having a close, confiding relationship protects you from many stresses. Make a list. Include all of the important things you need to handle each day. Try to follow the list so you feel organized and on top of things. Put together a coping plan step by step so you have a sense of mastery. This also helps you focus on the fact that you’re keeping track of and managing those as well as you can. Be aware of your body’s signals. By keeping an eye on things that might suggest you’re not coping well. For example, are you smoking or drinking more, or sleeping less? Learn to identify and monitor stressors. Aim for seven to nine hours a night of sleep. Come up with an organized plan for handling stressful situations. Be careful not to overgeneralize negative reactions to things. Avoid toxic habits. Control usage of caffeine, alcohol, nicotine, junk food, binge eating and other drugs as your primary means for coping with stress. While they can be helpful once in awhile, using them as your only or usual method will result in longer-term problems, such as weight problems or alcoholism.